The passing away of a baby or infant is a tragic loss that can cause immeasurable grief. At Lodge Bros Stonemasons, we aim to assist you during this difficult time by handling the process of creating a baby headstone or marker with the utmost compassion and respect. 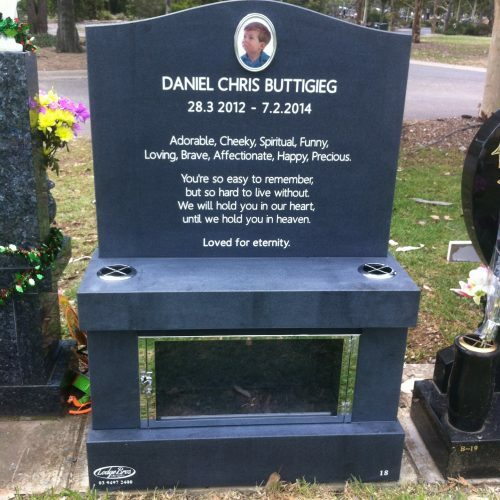 Whether you’re after a small marker or a large headstone, we can provide a range of personalised options that are designed according to your exact specifications. 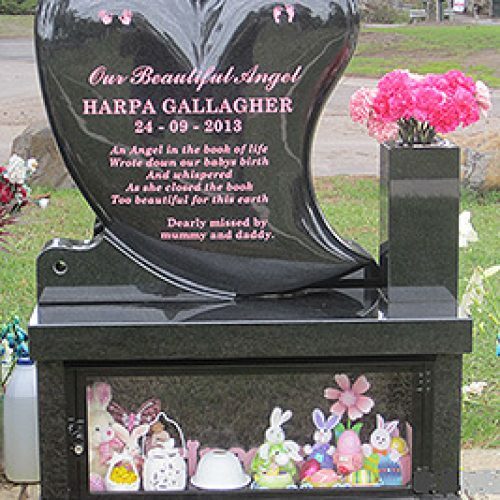 Pictures and text : Our infant headstones and grave markers can be personalised with pictures and photos that are etched into the granite. Our options can also be customised with specific details such as names, birth and death dates, messages and inspirational quotations. Materials : We’re able to craft memorials and markers out of a range of materials, including bronze and many types of granite. Styles: We can provide headstones in various shapes and styles, including options that are ornately decorated with angels and cherubs. 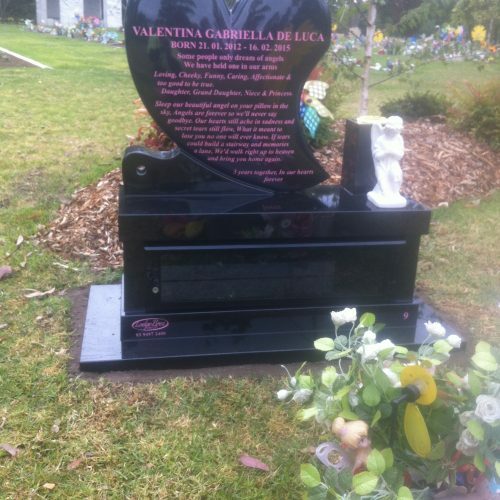 Sizes : While baby memorials and headstones are usually smaller compared to adult markers, they can be made any size you wish. Speak to us about your specific requirements today. 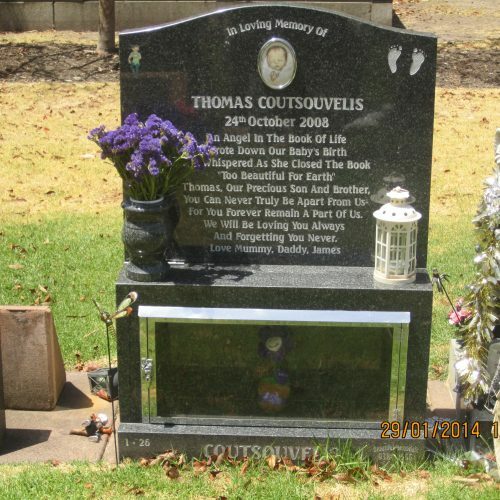 Why Choose Lodge Bros Stonemasons for Baby Memorials and Headstones? At Lodge Bros Stonemasons, we understand that the death of an infant can be an extremely devastating time. 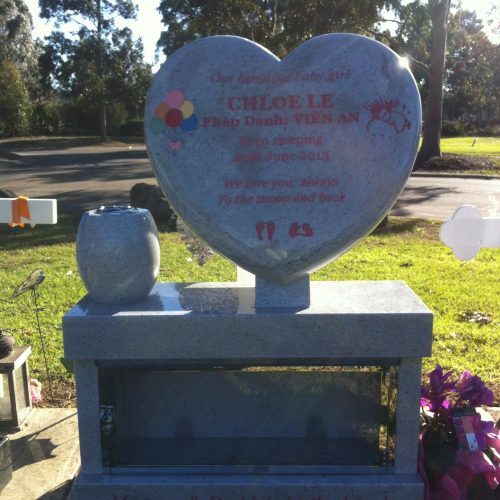 You can trust that our compassionate staff will handle the process delicately, helping to make the process of selecting and designing an infant headstone as easy for you as possible. With nearly 100 years of experience, you can rely on our team to provide the highest quality materials to result in a touching tribute that will last for years to come. To obtain more information about our available options for baby memorials and headstones, contact Lodge Bros Stonemasons today. Call us on (03) 9497 2400 to discuss your needs with our team, or submit an online enquiry.